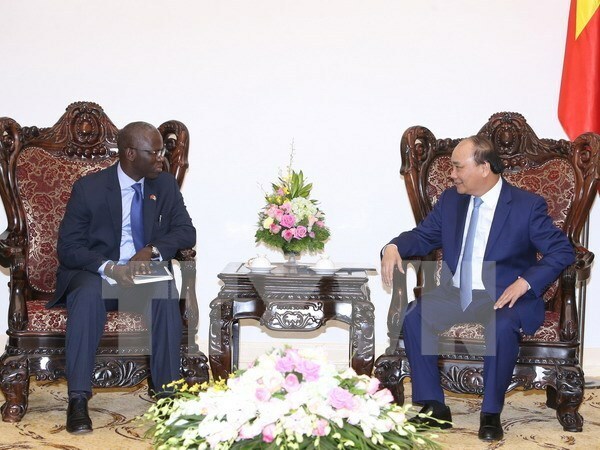 Hanoi (VNA) – Prime Minister Nguyen Xuan Phuc congratulated Ousmane Dione on his appointment as new Country Director for the World Bank (WB) in Vietnam at a reception at the Government’s headquarters in Hanoi on October 4. He said the WB is important to Vietnam and bilateral relations are being reinforced, which is attributable to the role of the WB Country Director who acts as a bridge linking his country and the WB. Victoria Kwakwa, the predecessor of Ousmane Dione, fulfilled this role, the PM said, expressing his hope that Dione will promote current attainments and strengthen ties between the two sides. He also appreciated the WB’s assistance to Vietnam, especially in the making of the Vietnam Report 2035. He asked the WB to continue supporting his country in socio-economic development, particularly in poverty reduction, health care, and climate change response. For his part, Ousmane Dione expressed his honour to work in Vietnam and congratulated the country on its impressive development progress. He added Vietnam is also an example for many other developing countries to follow. He shared the host leader’s view that the close bilateral relationship covers not only finance but also the sharing of experience in making development policies.